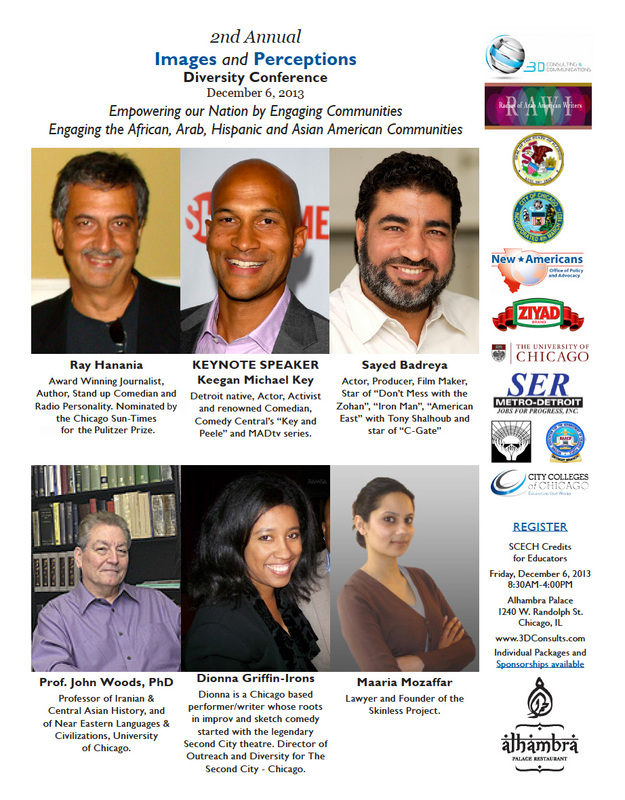 Hanania joins keynote speaker and Comedy Central performer Keegan Michael Key, Hollywood actor and filmmaker Sayed Badreya, Middle East expert Professor John Woods, Second City Improv Director of Ethnic Outreach Dionna Griffin-Irons, and lawyer and activist Maaria Mozaffar. The Images & Perceptions Diversity Conference is hosted by Siham Jaafar, owner of 3D Consultants based on Detroit, Michigan. Siham has hosted more than a half dozen diversity conferences. This year’s conference is held at AlHambra Palace, 1240 W. Randolph Street, Chicago, on Dec. 6, from 8:30 am through 4 pm. Visit www.3DConsults.com for tickets and more information.